Lithia Black's wardrobe: "Almost finished"
...it feels like my moon ray stays has been in the "almost finished" state for a really long time. I've worked on them on and off since my last post that was painfully long ago. The reason for this project taking me so long is several, some is work related, some is due to personal issues .Anyway bare with me, here comes a recap of what happened to the stays since my last post. In the end of 2011 I only had the sewing on the straps, piping, binding the edges and lining to do when I decided to wear it in it's half finished stage to an event. 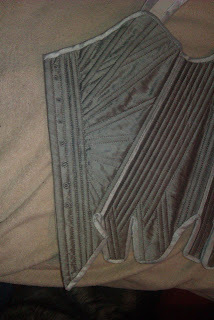 I ripped it, one of the front panels tore right of in the seam. I got so mad that I lost the urge to work on it. In the second half of 2012 I started to long for 18th century again. I looked at my stash of fabrics intended for my 18th century wardrobe and decided that now I want this damn thing finished! So I fixed the ripped seam (it was only the thread that broke, not the panel it self), re-enforced it and all of the other seams and worked through the painfully slow process of adding the piping on top of the seams. When I was doing it I hated myself for coming up with the idea of piping but now I'm glad that I did it. My stays looks so nice with it! With the help of Elisa from Isiswardrobe I did a new fitting and we discovered that I would benefit from a gusset at the bottom edge between the mid back and side back panel. She also helped me to fit my straps. Both the straps and the gussets are made of one layer of dupion backed with one layer of the linen twill, I believe it's sturdy enough. 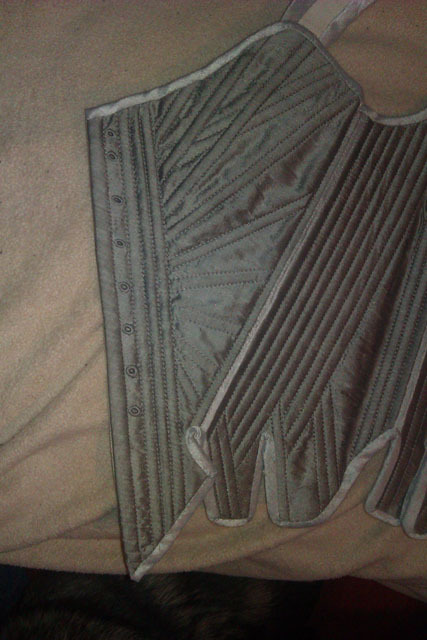 So here are one half of my stays, (I focused on the moon ray front) the only thing left on this half is making two eyelets for the ribbon that connect the strap to the front. The other half not pictured is in the process of getting it's top binding stitched down, then I'll add the lining and I can work eyelets on that half too. Then they are finally ,truly finished and I can work with the rest of my wardrobe again! I promise to post better pictures when this forever project are truly finished! So, sorry all my readers for my absence, but look forward to me being back in the costuming game with a vengeance!